At our 2018 AGM on 21st of August the WWEA recruited several new members into our programme group with the intention of creating a rich, vibrant and radical programme of workers’ education for 2018/19. First up will be a series of three social justice forums to be held between now and the end of the year. 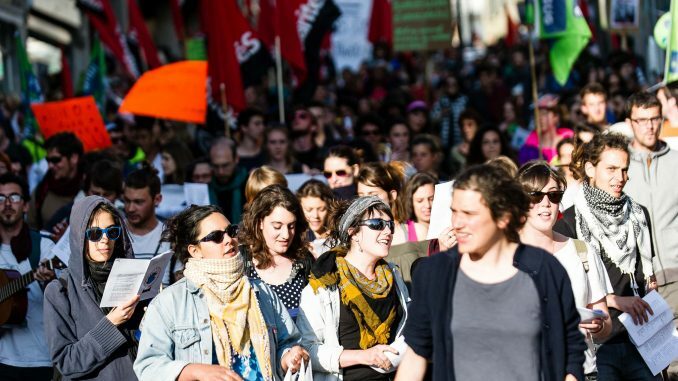 Each social justice forum will be led by activists from campaigning groups in the Wellington region and will introduce the issue before leading participants in a debate, discussion or some other activity. On the 16th of October activists from Peace Action Wellington will lead a discussion on Aotearoa and the Arms Trade and offer participants the opportunity to practise non-violent direct action tactics. Local activists from People Against Prisons Aotearoa will lead the the second forum on Prison Abolition on the 14th of November, and will discuss their campaign of material demands that take the path to prison abolition, including a current campaign to end the brutal and dehumanising practise of solitary confinement. 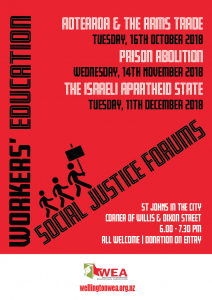 Finally, on the 11th December Wellington Palestine activists will discuss the the Israeli Apartheid State and their plan of activities for actions to boycott, divest and sanction Israel. Each of these events will, be held in St Johns in the City on the corner of Wills and Dixon Streets, from 6.00 pm till 7.30 pm. Everyone is welcome and will be invited to donate to the WWEA.